MeteoInfo is an open source software (LGPL license) suite, which includes two major applications: MeteoInfoMap and MeteoInfoLab. MeteoInfoMap was designed to view and analyze meteorological and spatial data interactively. Some GIS functions were developed from ground level. It has two editions: Java and C#. MeteoInfoMap may be run in Windows, Mac OS, Linux and Unix. 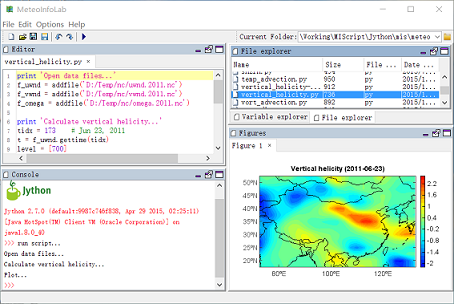 MeteoInfoMap can also be run automatically using MeteoInfoMap scripting with the Jython language (Java edition) or IronPython language (C# edition). The main functions are packed in the MeteoInfo class library, which could be used to conveniently develop the software. 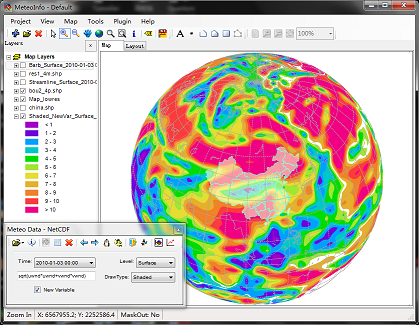 MeteoInfoLab was developed using Java and Jython based on MeteoInfo Java library (Unidata netCDF Java library is used). The purpose is to provide an optional scientific computation and visualization tool similar with MatLab and/or NCL.